Last Sunday, I celebrated the publication of “A Degree of Betrayal” by doing a book signing at Omaha’s best book store, “The Bookworm.” My son baked brownies, my editor prepared a short passage for me to read as an introduction, and I planned exactly what I would say. And I said none of it. Kindle: My sales ratio of 5:1 (Kindle to Paper) is inversely proportional to the weight of paper books to Kindle. Essentially, including my family, there were fewer than a dozen people and only one sale. The owner did, however, tell me that since advertising the signing a few weeks earlier, there had been a steady number of clients that came in and specifically asked for (and purchased) the book. But nonetheless, not a highly successful event. Fortunately, a career in science has prepared me well to accept failure, and has made my skin as thick as the bark on a redwood tree. But speaking of trees, paper book sales hardly tell the whole story. The point of this mono-blog is only partially self-congratulatory; what I really wanted to point out was the steady movement to e-books, which I find even my public library has begun to loan. After all, my own sales are 5 e-books to every paperback. I have always been in love with books; their texture and feel, smell, and just simply their physical presence has always reassured me. Books were (and are) an escape; but an escape in which I always find that I learn more about human nature. As a child (and even as an adult, but not to the same degree) I used to concentrate and immerse myself so deeply in books that I would not hear the telephone or doorbell, and would not respond to someone shouting my name from two feet away. It was well known that a family member would have to stick his hand in front of my eyes to get my attention when I was reading. I wish I had maintained that degree of concentration today, although I occasionally can feel something of it when I am very focused. So it was with a great deal of ambivalence – and even anxiety – that I finally gave in and purchased the cheapest Kindle version (dedicated e-reader with no frills) for $69. What motivated me to do this? My primary reason was one of convenience and weight. I travel a fair bit, and often find myself toward the end of a book as I start to pack. What to do, take 2 books for an overnight stay? But these are often heavy, 600 page hardcover books from the library! But the weight of the books is always outweighed by knowing that there’s nothing worse than being stuck at an airport or on a flight without a good book to read. To me, it’s a disaster. And worse, with my frequent bouts of insomnia, finishing a book at the beginning of a “white night” is definitely not something to look forward to. And so I took the plunge. With the Kindle now up and running, it really is something of a miracle for a book lover. Instant access, storage of books that will keep me busy for months at a time, and all smaller and lighter than a tiny single paperback. For now, I am still reading my heavy library hardcover books, but by the time I get back from my next meeting this summer, I don’t know whether I may have a radical change of heart toward the digital era of book reading. This entry was posted in Uncategorized and tagged "Matter Over Mind", A Degree of Betrayal, author, book sales, books, ebooks, Kindle, library, omaha, reading, The Bookworm. Bookmark the permalink. 6 Responses to Reading into a major lifetime change? As usual, I’ve been scooped! I actually meant this in the “great minds think alike” spirit! I had been something of a Luddite where e-books were concerned but your comments and Drabble’s have shifted me significantly towards buying an e-reader. Yes, eBooks are great, especially for travel. Mrs Crox bought me a Kobo Mini for Christmas. It’s just big enough to read comfortably and small enough to slip into an inside pocket. Before I go anywhere I load it up with thrillers. It’s been a godsend for conference travel and general hanging-around at airports – and, yes, when jetlag strikes, for whiling away those lonely hours when you can’t sleep. My iPad, too, is really useful. Having read Margaret Drabble’s article Philip kindly highlighted, I had a similar experience. I came to the end of a book during a long layover in Sao Paulo airport. What to do? The bookstore only sold titles in Portuguese, but the airport did have free WiFi, so I simply downloaded something else and continued reading. I have so far resisted the e-book thing… mainly because I too like the look and feel and ease of use of “real” books, plus not having to turn them on or recharge them when the battery goes flat. 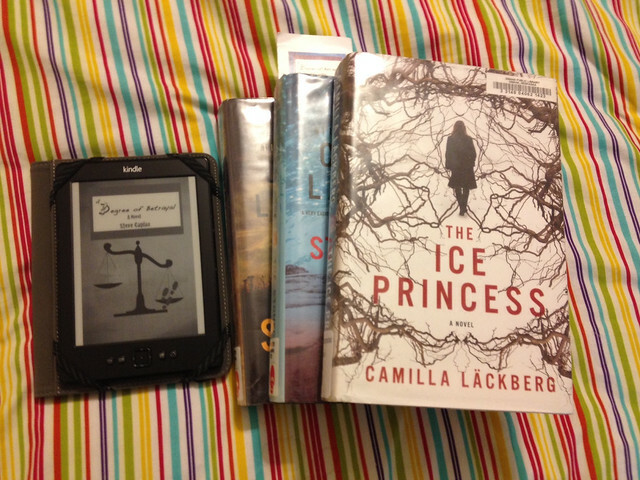 Others in my home use Kobo (think Kindle for Canadians) or iPads for the same purpose.